Last year ZTE tried to make a splash with two main products, a projector that doubled as a mobile hotspot and a budget smartphone for pre-paid carriers that aimed to compete with flagship phones that cost twice as much. These efforts were impressive, even if they didn't make as big a splash among mainstream consumers. At CES this year the company announced two new products, a $199 6-inch Android smartphone, the Grand X Max Plus with the carrier Cricket (no contract), and the ZTE SPro 2, a projector that doubles as a mobile hotspot. Deja vu, right? Not that this is a bad thing. A full-featured Android phone that cost $199 outright is pretty rare, and ones worth having are even rarer. It will be out on January 9th and we hope to get some hands-on time with it soon. The belle of the ball in Vegas was actually the SPro 2. ZTE gave us some time to check it out and I came away wanting one. It projects 720p HD at 200 lumens, which is very bright and quite crisp. It includes all the features you'd want in a tiny projector, such as auto focus and auto keystoning (keeps the projection rectangular even if the projector isn't at the optimal angle). It also runs on Android, which opens up a whole slew of other features. Like any Android device, the SPro 2 will be able to download and use apps, so you can project a Netflix movie without having to connect a laptop or a smartphone--just run the app from the projector. Want to show everyone your presentation? Just bring it up in Google Drive. Of course it also works just like a regular projector with HDMI input as well as Wi-Fi Projection capabilities. There's a USB port on the back which supports webcams, so you can use the SPro 2 for making video calls with a computer or without. All the projections I saw in the demo area were crisp and colorful, and I like the idea of being able to throw my Google Hangout video chats on the wall while I kick back. ZTE didn't give us much information on the mobile hotspot side of the SPro 2--not even the carrier. All they said is that it's coming out early this year and will be sold through a carrier partner. The first generation went through Sprint, so maybe that will happen again. There's also no announced price. Hopefully they'll let us know soon. I can see this being a good product for road warriors who spend a lot of time giving presentations and don't want to use their phone's data every time they need Wi-Fi. With the video conference compatibility it also makes for a nice change from having to look at the people in your call on a small screen. But projectors aren't just for business purposes. I can see this as a good addition to family trips, especially if they're long. Whether it's good for families will depend on pricing and carrier. I'm looking forward to seeing both of these products. 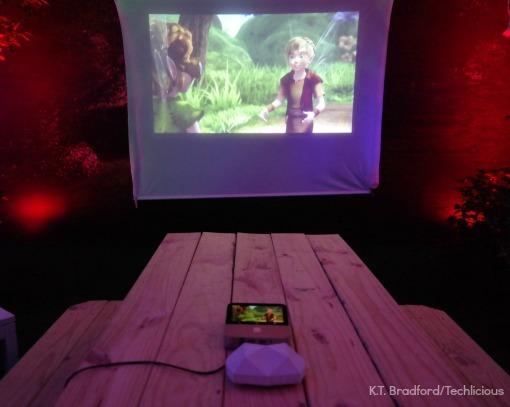 Does the lure of a portable projector that doubles as a mobile hotspot tempt you at all?